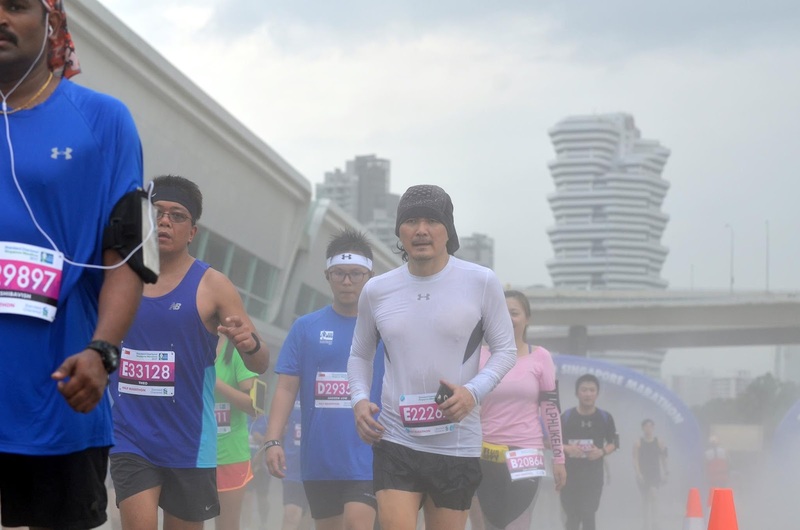 I know I blogged earlier I wasn't joining this year's Standard Chartered Singapore Marathon. Then two weeks ago, I came across someone selling his half marathon slot online for $70 (usual is $95) and I couldn't resist. Apart from a very late flag-off for my wave, I have no complaints about Sunday's race. Let me address the issues one by one. I wasn't affected by this because I never bring a bag to a race. I carry all the stuff I need (ez-link card, cash, ATM card, credit card, key) in my shorts pockets, Sprigs wrist wallet and sometimes a waist pouch. Sure, there are times I wish I brought fresh clothes and footwear to change into after a sweaty race, but it's really not worth the queue to deposit my bag and then again to collect it. Apparently, the bag deposit delay also had the ripple effect of some hired buses not being allowed to drop off runners at the designated area due to the long queues, and hence the delayed flag-off. It might have also led to the next complaint. Finisher tees are only for those running the full marathon. I was in the half. So not being fit enough to complete 42km saved me from this hassle. So I didn’t have the problems that many others did. Unless you count the late flag-off. Because of the long wait for the flag-off, runners were literally just sitting around. Flag-off was supposed to be at 4.30am. I didn't cross the start line until after 5. But I like that the start line was at Orchard Road. This was the main reason I wanted to join the race. 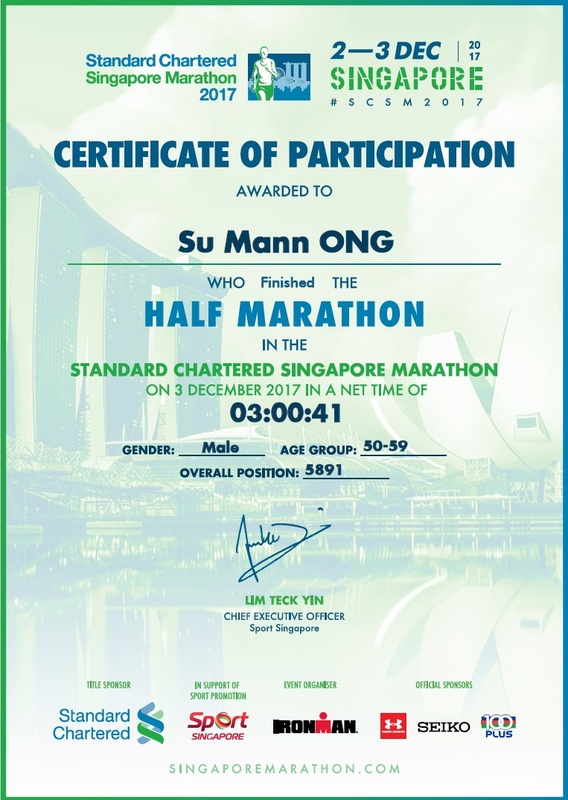 The first half of the route was great, going past Bugis, Jalan Sultan, Chinatown and Robinson Road, and then it was same old, same old around Marina Bay again. 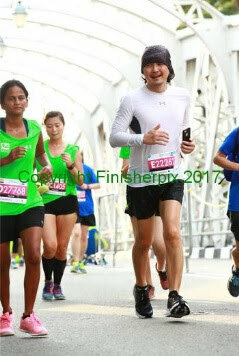 For 5km, I was still on pace to run 21km in less than two and a half hours. Then the 2h 30m pacers passed me. 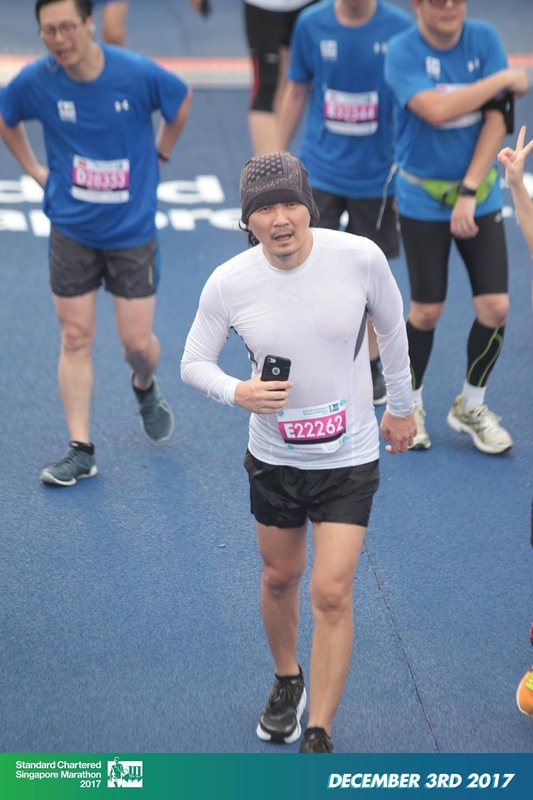 After 10km, I just didn't care about my time anymore and started walking, interrupted by occasional jogging, usually when I approached a hydration point (or see a photographer). Because of my year of injuries, I've been skittish about training and lost the motivation to push myself. Also, I needed to pee. As I was walking, I spotted Singapore's Blade Runner ahead of me. I walked behind (and beside) him for a while before working up the courage to ask him for a selfie. He said he was doing the full marathon and complained about the humidity. I told him I interviewed him at the Swissotel Vertical Marathon a few years ago for The New Paper and he remembered the article. Then I saw the 2h 45m pacers catching up and decided to chase them for a few hundred metres before giving up again. I was highly entertained by this guy’s shirt. I jogged for the final kilometre because I didn't want pictures taken of me walking. My eventual time was 3h 41s.